On Friday evening I was treated to dinner at The Honours, one of Martin Wishart’s restaurants in Edinburgh. Located on North Castle Street, there are plenty of nearby options for pre dinner drinks, and we decided to go to Tonic, a cocktail bar a few doors along from The Honours. Take a peek online at their cocktail menu, I think you’ll like it as there are lots of fun combinations to try. On this occassion I opted for a Rasberry Kiss. 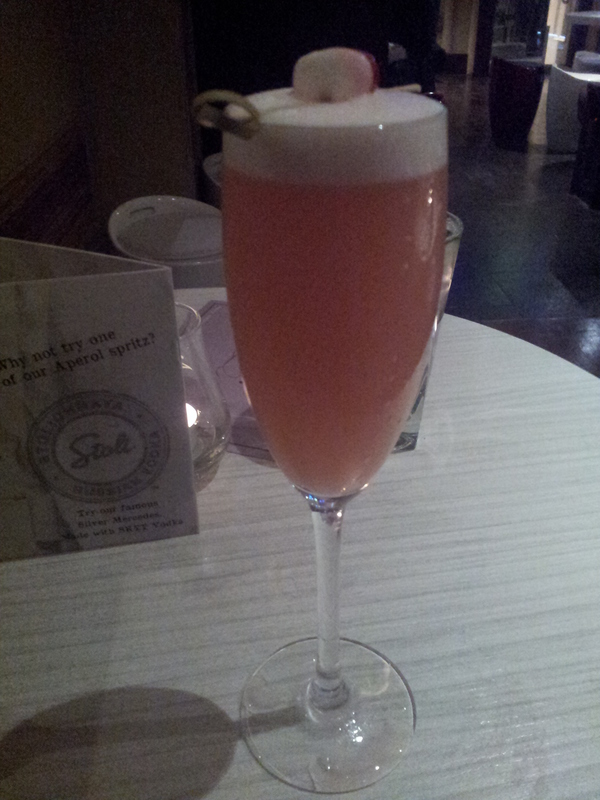 Made up of tanquery gin, grapefruit, homemade rasberry syrup topped with prosecco, it was yummy! The Haribo lips sweetie on top, is a good reflection on the sweetness of the drink! After a couple drinks I only had to totter a few steps down the hill in my heels to arrive at The Honours. Unfortunately I don’t have any of my own pictures of the meal, so hopefully we descriptions will do the dishes justice! You can take a look at the menu online here, and I’ll try and talk you through the yumminess! To start I opted for the crab cappuccino, and I’ll admit I was not quite sure what the expect. I was greeted with frothy and intense crab soup. It came in a large shallow bowl and had lovely pieces of soft crab and garlic through it. I’m a huge garlic fan, the more the better, so this was right up my street. The size of the dish was deceiving and due to the richness of the cream based soup I wasn’t able to finish it which is extremely unlike me! For my main course I enjoyed the fillet steak, which the waitress informed me was cooked on the bone. A technique, she told us, used to hold in the flavour and juices from the meat when cooking. I had never tried fillet on the bone before, so that was quite exciting. The steaks are are served with vine tomatoes and choice of sauces, I went for a bearnaise sauce and ordered a side of potato dauphinoise (see, garlic again!) and shared some green beans. The steak was cooked to perfection – I like it medium and it melted in my mouth. Absolutely delicious and totally worth the special occasion price tag (£32). Dinner was washed down with a bottle of Fleurie. This wine, in my opinion, (and I have to say I’m no wine expert, at all) is a really light red wine – perfect for those who are eating red meat but aren’t wild about red wine! The dessert menu was extensive, and after two very filling courses all I could manage was a scoop of passion fruit sorbet. All the ice creams and sorbets on the menu are offers as a whole dish or simply a single scoop. A really nice touch for those who aren’t quite finished but can’t manage a whole dessert. After coffees and a desert wine we decided to call it a night. I mentioned that our trip to The Honours was a treat, and I’d love to say I’ll be back in a flash, but the prices simply don’t allow for that. However at the end of the day we were looking for a special evening we would remember, and that was exactly what The Honours gave us. So, thank you! QWe really fancy a trip to the honours, i take it you would highly recommend? Yes really lovely, simple food done with a twist. It was pricey but not as much as we thought, we were £75 a head for three courses wine and coffee.